Blogging is a great way to market and promote your business. A well-written blog can establish you as an expert and authority in your marketplace and industry. One challenge many bloggers face, however, is attracting and building an audience. To overcome this you need to put out great content that is unique and valuable, and do it consistently. There’s one marketing tool that can help you grow your audience and keep them coming back for more, and it’s more effective than just about any other method out there. That method is email marketing and it has become a leading force in business. To be sure you are using email marketing to its greatest potential you need to be testing. Email marketing testing can show you what content engages your audience the most, what words get them to open your emails and as a result drive traffic to your blog. And according to Neil Patel, that traffic can account for 14% of your blog’s overall traffic if not more. So how do you do this? The easiest way is through A/B split testing your email messages. Let’s examine this and learn more about how it can help drive readers to your blog. A/B split testing will help you pinpoint the areas you need to work on to increase the effectiveness of your email campaigns. Do graphics entice the recipient to click through to your blog? Should you mention your blog in your subject line? A/B split testing can help you suss out the content, design and message that works best for your audience. “Walk into any marketing department in the land and ask the first person you see, ‘Which is the best day to send out an email?’ I guarantee you will get seven different answers, or maybe more. The only way to prove the answer categorically is to test one option against another in a head-to-head response-off!” says Lucy Acheson, head of data planning at WDMP, in her article, Email marketing: The beginner’s guide to A/B testing. The concept is relatively easy: to run an email split test, you create two messages with different content or different subject lines, for example, and send them each to a small, randomized, equal portion of your entire mailing list. Track the results of each email, and the one that gets the highest percentage of opens or click-throughs is the one that you send to the remainder of your mailing list. Seems simple enough, right, but where do you start? Like all email marketing campaigns, there are various aspects that can affect the open rates, click-throughs and other metrics. Determining which variable to test is the first step on the journey. Subject line – Test a personal vs. formal subject line or to include or not include the company’s name to gauge which among the two garner better responses. From line – Who the email comes from, i.e. personalized, or the company’s name, could affect responses. Time of delivery – Test to decide what day of the week or time of day gets the best results. Call to action – Because a call to action elicits users to click on links, try out varying colors, sizes of links or different tag lines to find out which gets the most clicks. Layout, format, color-scheme –Test varying themes and color schemes to find out which is most pleasing for the client. Email length – A/B test the optimal length of email for your audience. Try out long and short emails that both give varying amounts of detail. Deciding what variable to test, i.e. subject line, time of delivery, etc., is the first step in the A/B split testing process, but where do you go from there and what should you avoid? According to Mitch Lapides, President of FulcrumTech, there are seven steps to effective A/B split testing. Choose the variable you want to test. Choose what measure of success you’ll use to determine the winner. When choosing this measure, be sure to focus on what you are really interested in in terms of enticing email recipients to read your blog. While one email might yield high open rates, if you are most concerned about people clicking through to your blog, then you should focus on click-through rate results. At Business Consulting Buzz we’ve recently been running tests looking at how to increase our own click-through rates from emails. We have a large readership and our open rates have been decent, but our click-through rates need improvement. So we’ve decided to focus on that metric. Develop a research question to test. Test only one variable at a time. For accurate results, be sure you’re testing only one variable at a time. 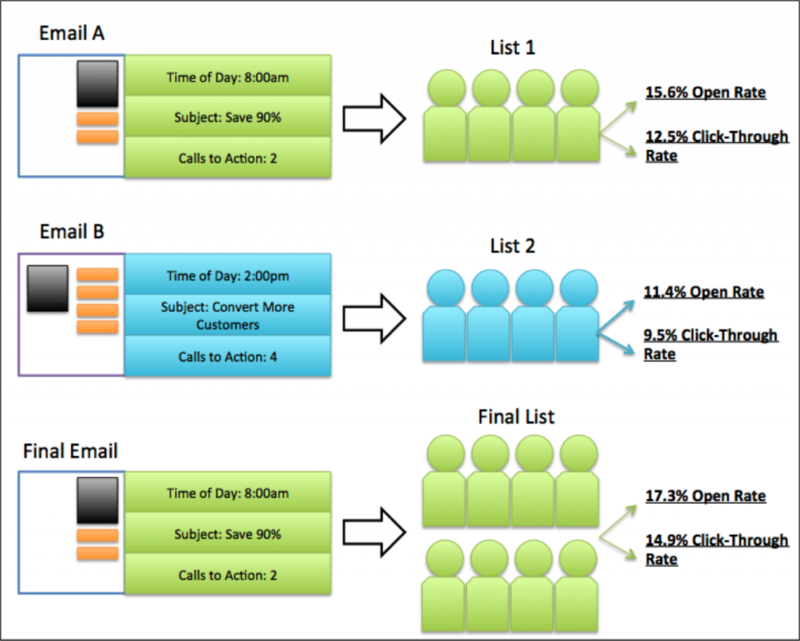 Which call to action produces the highest click-through rate? Which day will generate a higher open rate? Which headline results in the highest click-through rate? “In other words, if you’re testing subject lines and you send version A to one group in the morning and version B to a group in the afternoon, you won’t know whether it’s the time of day or the subject line that had the biggest effect on the open rates,” Lapides relates. Randomly divide your list into two equal segments. Be sure your sample size is large enough to make a statistically valid decision. Your email list will determine how large your sample size should be. For a large list, you may be able to test only 10% of your list. For a small list, you may have to use the entire list to get statistically valid results. You can find online tools out there to help you figure this out, such as the Split Test A/B Test Marketing Calculator. Use the available testing tools. Many email service providers offer tools for running A/B split tests. If you are not equipped to run these tests on your own, or aren’t a particular fan of statistics, there are online options to help. When you test, there are a couple of things that you will want to avoid to get the best results. Virginie Bernard of Experian Marketing Services suggests that you avoid testing during times that are not the norm. Testing during off times for your customers, like the holidays, on weekends, evenings, etc., could introduce an external factor that will influence your results. It is also important to remember that just one A/B test will not cut it. While the end result may be to drive your audience to your blog, each campaign you send is going to have different results. Just because one A/B test on subject lines yielded an email that sent droves of readers to your blog doesn’t mean that the same type of subject line will always work for future campaigns. You have to continue to evolve and plan an ongoing test cycle. Through A/B testing you can identify the elements of an email campaign that can best get readers to your blog. Testing subject lines, delivery times and a variety of other variables can really help you get to know your audience and the best way to reach them. But don’t forget once you do all the leg work to get them there, you want to do what you can to keep them coming back. Keep your blogs personal and relaxed in tone. Be sure to take the time to respond to blog comments and emails. Offer your readers something of value and make it clear that you care about them and their opinions. This will go a long way to growing your blog and garnering loyal readers and potential customers and clients. Michael Zipursky is an author, consultant and entrepreneur. He is co-founder of Business Consulting Buzz, a website dedicated to helping people become successful consultants. Michael is also actively involved with FreshGigs.ca, a jobsite specializing in marketing, communications and design jobs in Canada.